competition bikinis - for fitness and bodybuilding athletes. Miss Bikini Fitness creates beautiful bespoke fitness bikinis that radiate confidence on the stage. Our website will allow you to fully customise your own competition bikini from start to finish. You can build your dream competition bikini by using the “Custom Made Bikini” page above which will give you the ability to play around with different colours, bikini styles and budgets. 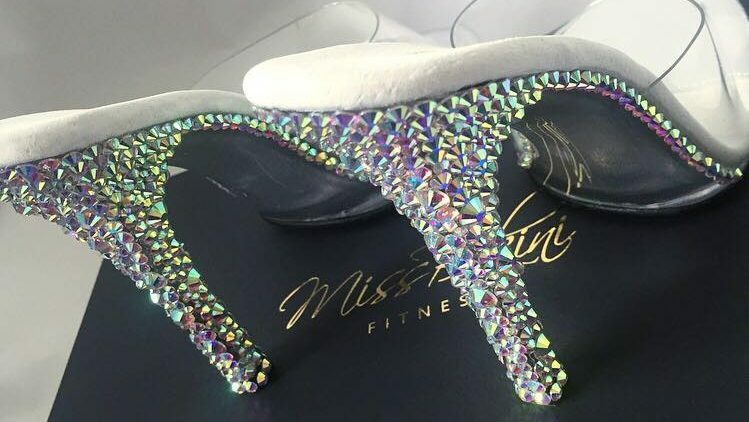 We now customise posing heels too please check out our range of heels by clicking this link. Here at Miss Bikini Fitness the customer is the final filter. Click the button below to start your bikini journey. Details – SALE NOW £250!! This wired bra has the most support as it works to push everything you have up to the front! Whether you have implants or natural breast the wired bra is great to keep everything in place. The wired bra comes with a push up effect to create a fuller breast structure to emphasise the cleavage. This style is one of the most popular bras due to its ability to create symmetry across the breasts. Competitors who still have a good amount of breast tissue are best suited to the push up bikini. We now stock three different shapes in this bra to make sure all competitors can choose this style and not worry about gapping !! The A and B cups have no padding – but don’t freet ladies this is much better as build in padding just creates a massive gap with girls who have little breast tissue. The better thing to do is place removable padding into your bikini ( which will be cut to your personal measurements). We also stock extra push up and extreme push up bras feel free to email us your progress pics for extra assistance. The high waisted briefs offer 50% coverage on the bum and aim to lengthen the competitors legs. The fabric pulls over the hipbones create a V like shape. Brand New – Only been worn to model for website picture, all bikinis have hygiene straps when modelled. This wired bra has the most support as it works to push everything you have up to the front! Whether you have implants or natural breast the wired bra is great to keep everything in place. The wired bra comes with a push up effect to create a fuller breast structure to emphasise the cleavage. This style is one of the most popular bras due to its ability to create symmetry across the breasts. The high waisted pro cut briefs will show more of the glute area in comparison to the 50% coverage briefs. The style of these briefs aim to lengthen the competitors legs. The fabric pulls over the hipbones create a V like shape. Details – SALE NOW £165! The briefs were not pre-made for this design therefore any size can be specified to suit the customer. Please allow a week for delivery due to custom briefs made. Brand New – Was made for an ex-sponsor but wasn’t the correct sizing. Only been worn to model for website picture, all bikinis have hygiene straps when modelled. This style of bra is ideal for girls with smaller chest as it sits completely flat to the breasts. It provide excellent support with minimal gapping, which means when you turn to do your side poses you wont see a big gap between your breasts and the bra. This bra comes with ready made moulded bra pads but also has the benefits of adding additional padding to help give that extra boost! This style of bra only fits sizes A-B we do not do this style above B. For ladies sized above a B please select the triangle or wired bra. The low waist briefs offer 50% coverage on the bottom area and aim to lengthen the abdominal area as the fabric sits straight along the hipbone, making sure as much abdominal area is on show as possible. You can also add extra removable padding to your cart for just 3 bucks! Please see our accessories page. Details – SALE NOW £250! The low waist briefs offer 50% coverage on the bottom area and aim to lengthen the abdominal area as the fabric sits straight along the hipbone, making sure as much abdominal area is on show as possible. However this particular bikini has added details over the hip to create the high waist look that aims to lengthen the legs as the lace fabric pulls over the hipbones creating a look of a smaller waist. The triangle bra comes with padding and high waisted briefs. This type of bra is popular amongst all fitness competitors. The benefits of choosing this style is the adjustable straps which to help boost the breast were needed, big or small. This style of bra is ideal for everyone as the fabric sits flat to the breast, which helps minimise gapping between the breast and the bikini. This style comes with removing padding but also allows room for extra padding to be inserted for that extra boost! You can add extra removable padding to your cart for just 3 bucks! Please see our accessories page. This type of bra is popular amongst all competitors. Whats is great about this style is the straps are adjustable which to help boost the breast were needed, big or small. This style of bra is ideal for everyone as the fabric sits flat to the breast, which helps minimise gapping between the breast and the bikini. This style comes with removing padding but also allows room for extra padding to be inserted for that extra boost! Bikini Fitness – A Checklist For Show Day!